Stay in our beautiful home on the peaceful lakefront. The house has stunning views in all directions, modern decor, a gently sloping yard, and a private dock for guest use. Trinity lake house is a 3 Bedroom, 2 bath that has been newly renovated, taking advantage of natural light through numerous windows and 3 skylights. The 3 BR's are all equipped with queen beds. In addition to having a queen bed, bedroom 3 is also equipped with 4 beautiful, rustic bunks, and so sleeps a total of six if so desired. There is also 1 queen pull out sofa bed in main living area. The kitchen/main area of the house is open design, combining a spectacularly renovated kitchen that flows into a seating/TV area that accommodates 13. 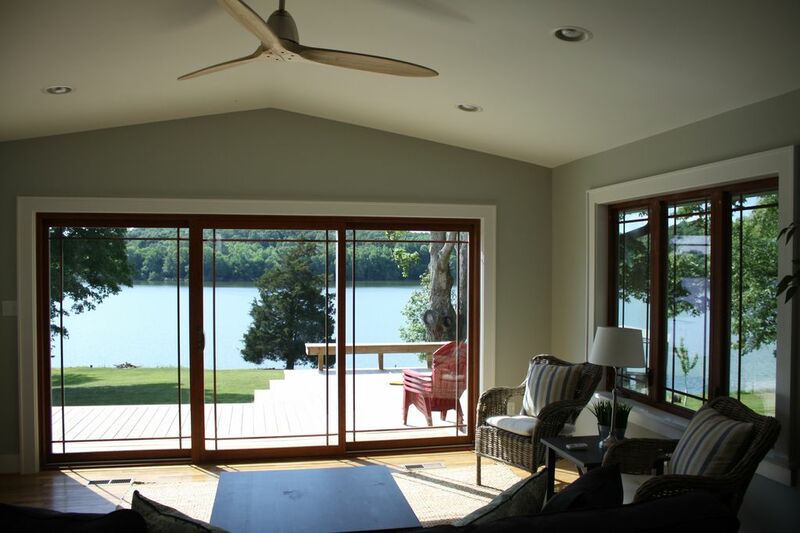 The living area has a large TV, gas fireplace, and ample seating to view the lake. A canoe and kayak are also available for guests to use on the private dock. It’s often hard to get a true picture of some destinations on VRBO but this house exceeded our expectations. A Beautifully decorated house and outstanding view of the lake from the back deck set the scene for an awesome family weekend. The house was well stocked with kitchen appliances, cookware, etc. so all we needed were the groceries to complete our meals. Looking forward to another visit! Very clean, very quite, very relaxing place. You can see every Star at night. If you stay here go to the grocery store before you get there, kitchen is stocked with everything you need. There are very few restaurants. Overall one of my favorite VRBO experiences. Enjoyed our stay very much, house was super clean nicely updated. Definitely hope to visit again! We enjoyed our stay very much. The location was great, the view is superb and the house itself was extra clean and perfect for our needs. We hope to come back and stay again, it's a true gem. Beautiful home in a peaceful setting! Beautifully updated and furnished home set on a quiet lakefront property. Our family had such a restful and relaxing time. We enjoyed taking the canoe out on the lake, cooking in the gorgeous kitchen, and relaxing by the fireplace. We also spent an afternoon hiking and exploring at the Land Between the Lake recreation area. We are already making plans to return! Just the medicine we needed. The weather was chilly with off and on rain. Even with the weather not cooperating, we had a wonderful time. The house was very well finished out and in a nice neighborhood. It’s obvious the owner(s) put some thought into the furniture, appliances, etc. They DID NOT go the cheap way out. Only an hour and a half from our home, we’ll be coming back when the weather warms up. Thank you very much for the use of this charming retreat at the lake.